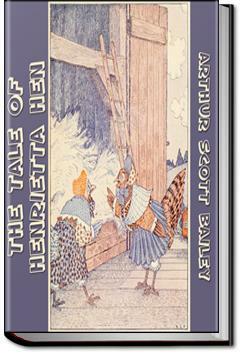 The Tale of Henrietta Hen is a cute children's book filled with the adventures of a hen named Henrietta. Henrietta Hen announced that she was sorry for them. "Every brood," she declared, "should have at least one swimmer in it." She began to strut up and down the edge of the duck-pond, clucking in a most overbearing fashion. Really, she had never felt quite so important before—not even when her first brood pecked their way out of their shells. "There's nothing quite like swimming," Henrietta Hen remarked with a silly smirk. "If it weren't for getting my feet wet I'd be tempted to learn myself. No doubt my son could teach me." "Your son!" the old white hen sniffed. "He's not your son, Henrietta Hen. Somebody played a joke on you. Somebody put a duck's egg under you while you were hatching your eggs. And I think I can guess who it was that did it." Cute children's story about a conceited (and rather stupid) hen.